In 10-inch skillet, heat oil over medium heat. 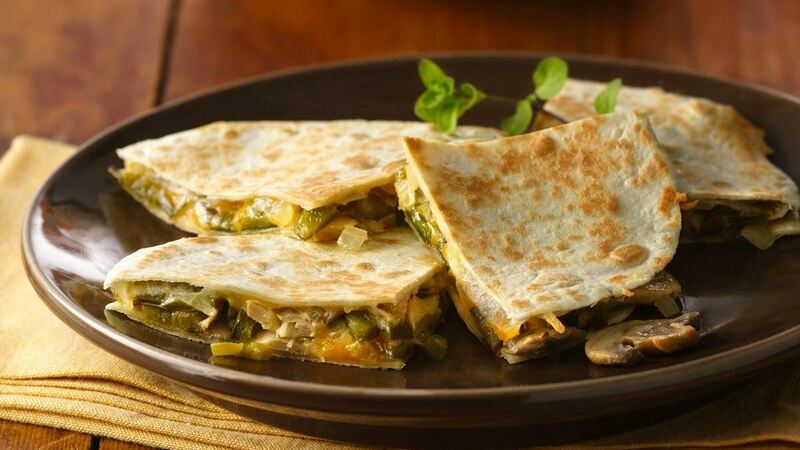 Cook chiles, onion and mushrooms in oil 10 minutes, stirring frequently, until tender. Divide vegetable mixture evenly onto 4 tortillas. Sprinkle each with 3 tablespoons cheese. Top with remaining tortillas. Wipe skillet clean with paper towels. Spray skillet with cooking spray; heat over medium heat. Place 1 quesadilla in skillet; cook 1 to 2 minutes or until golden brown on bottom. Turn; cook 1 to 2 minutes longer or until golden brown on bottom and cheese is melted. Remove from skillet to serving platter; cover to keep warm. Repeat with remaining quesadillas.